At St Catherine's we're all about students fulfilling their potential: whether that be in tutorials, in lively reading groups, or among student-run societies. University of Oxford degrees are conferred at degree ceremonies, held in the Sheldonian Theatre. You may graduate in person or in absence, either straight after you’ve finished your degree, or later on. If you choose to graduate in person, you will be presented by St Catherine’s College. 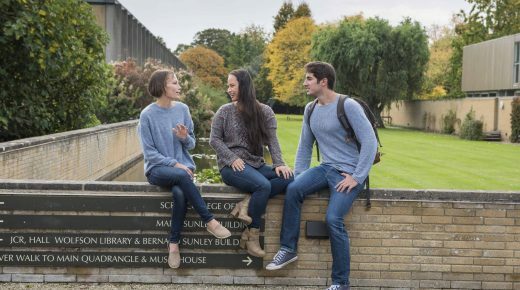 If you are a current undergraduate or taught graduate student you will automatically receive an email towards the end of Michaelmas Term during your final year with instructions regarding when and how to book your degree ceremony. If you are a current graduate research student, or a part-time taught graduate student on certain courses, you will automatically receive an email with instructions regarding when and how to book your degree ceremony, once you complete your course and are granted leave to supplicate. If you do not receive an invitation at this time, contact the University’s Degree Ceremonies team. 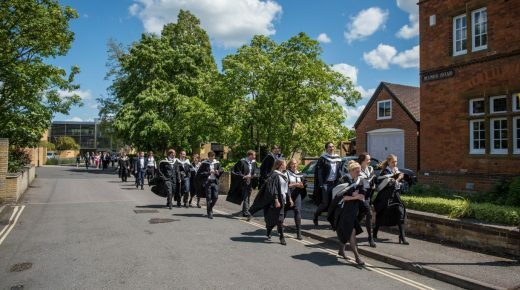 If you have already completed your degree and haven’t yet graduated (or if it is more than 21 terms since you matriculated and you completed a BA or BFA ,and you wish to receive an Oxford MA), please complete the online St Catherine’s degree ceremony waiting list form. Please see the University website for degree ceremony FAQs and more information. St Catherine’s usually attends degree ceremonies held in the Sheldonian Theatre at 2.30 pm however we would require you to be at the College from about 11.00 am to complete some of the formalities and attend a briefing with the Dean of Degrees. There is also a reception for you and your guests. You are entitled to bring up to three guests (minimum age of seven) and both you and your guests can have lunch in College. This is free for you and there is a charge for your guests. Once you have a place confirmed by the University for a degree day you will receive a pack from the College Office with all the details, including which gowns to wear. If you wish to have an Oxford MA conferred there is a charge of £40.00. If you wish to attend in person to have the Oxford MA, DD, DCL, DM or MCh conferred, would you prefer the non-Christian formula? •Would you like to opt out of your name being included in the degree ceremony brochure? A degree day brochure is provided to all guests on arrival at the ceremony. If you elect not to have your name published in the degree day brochure, please inform your guests in advance so that they know not to expect your name to appear and do not think there has been a printing error. To request a replacement university card, or request an extension if your card is about to expire and you will still be a student, please complete the form below. The Academic Office will be closed for Easter from Thursday 11 April until Tuesday 23 April. We will try to process requests for replacement University Cards within three days of re-opening. If your card has expired, what is your new expected leaving date? 3rd place in the Norrington Table – the first time St Catz has reached this level in 35 years. Two recent Catz alumni travelled to Edinburgh Festival Fringe over the summer, including Anna Livesey (2014, English Language and Literature) who produced Columns for a two week run.